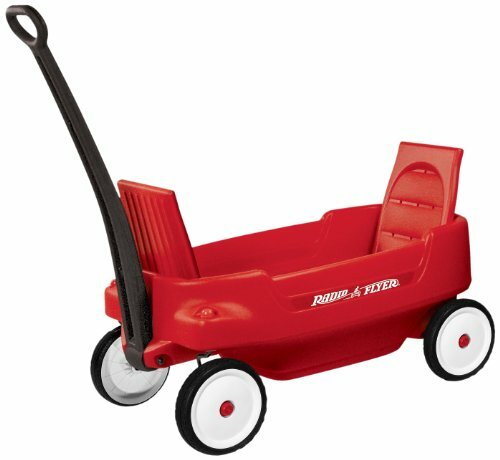 There are many different Radio Flyer red wagons to choose from for your child and many different and unique uses for them, other than just the typical play. If you are looking for one for your child, you will have lots of different models to choose from, which I would like to share with you. In addition, I would also like to give you some information about pricing, so you can know how much you should expect to pay. Let’s explore a little bit more about the models of Radio Flyer red wagons you might want to purchase for your toddler. This is the cheapest of all the models that you will find. In fact, you can buy from Amazon for under 20 dollars. The body is all steel and molded, without any welds. This one is actually not made for human transport; just for dolls and other toys. It is something a toddler can pull behind them and tow around their little toys. It is only about 13 inches long, so it simply does not have the size to fit a child and is not designed to do such. It is a cheap toy that your toddler will like to play with. This is a more modern, beefy version of the Radio Flyer red wagons for sale. It has real, natural wood sides that look great on it. This one is commonly referred to as the ATW model, meaning it is somewhat more capable of going on all terrain. The real rubber tires can be filled with air for a smooth ride over somewhat rough terrain. Pricing is all over the board, with most sellers coming in well under 200 dollars, with a reasonable price being right around $150 for a new model. Most of the models on this list are made of steel, but this one has a sturdy plastic body. Some of the features include cup holders, storage space, and two seats with seatbelts. This is a great one for pulling up to two children behind you as you go out for a walk. This one can be found for a little under 100 dollars if you buy new. It’s part walker, part wagon, but all fun. Radio flyer recognized that very young children had a harder time pulling them then pushing them, so a new breed or hybrid was created. It has wood sides, like some of the more popular ATW models, but it is made for the little ones. This one is not made of steel, but looks great with the classic red paint. You can find them on sale for around $80, but you might have to pay a little more than that if they are not on a sale. This Radio Flyer ATW wagon is very similar to the steel and wood model, with the some small differences. First, the wood sides are red, not natural in color. In addition, the body is not made of steel with this one; it is also made of wood. This is not the norm for the company, but the model is very sturdy and built well. If you find a good sale, you can buy them on Amazon and other sites for around $150, but prices of $199 are not out of line. This one blends the classic styling with the air filled tires, for a really smooth ride over rougher terrain. It has an all steel, seamless body and is prices at $180, but you can find them on sale for as little as $140, if you look around. If you get lucky enough to find them on clearance, you might be able to get them even cheaper. It is built well and should last your children for many years to come. This one is widely recognized as the one that started it all. If you don’t want to buy new, you can buy a vintage Radio Flyer Classic Red Wagon for sale pretty cheap. The originals are still around today, due at least in part to the quality construction that continues to this day. If you look around, you can buy them for under 100 dollars new and about the same price if you go with an antique or vintage model. This model was actually inducted into the toy hall of fame, a place where few toys have ever gone before. This red beauty is a little different from many of the others; it has a plastic body, cup holders, and a canopy on top. The canopy makes it more like a luxury cruiser than a cargo wagon. It will help to shield the sun or rain off your child as you pull them around. 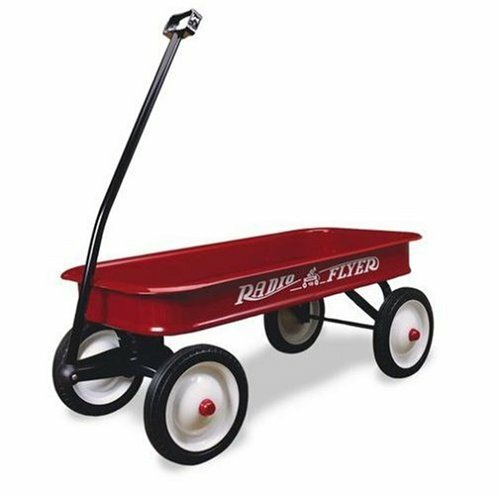 There are several different options and accessories you can buy to make your Radio Flyer red wagon a little more comfortable for your kids. The list below represents a few of the options. Canopy: It attaches to most models and will shelter your child from the rain and sun. It is priced at anywhere from $30 to $40, depending on where you shop. Clip-On Umbrella: This is a pretty cheap accessory that you can add which will serve a similar purpose as the canopy. It is generally under 20 dollars online, from most sellers. Storage Bag: It attaches to the back of your Radio Flyer red wagon to carry around drinks, snacks, sunscreen, or anything else you can imagine. It is under 40 dollars. Cushion Pads: You can buy a set of pads that will help to make it a little more comfortable for your kids to sit on. They cover the bottom and the sides of most models and are priced at about $70. While not really cheap, they are a very nice accessory to add. Radio Flyer Wagon 90 Pad: This one is made for multiple manufacturers, but will work great. The 90 pad works great with steel pan models and there are several aftermarket models out there pretty cheap. As you can see, with Radio Flyer red wagons, you have lots of options to keep in mind. 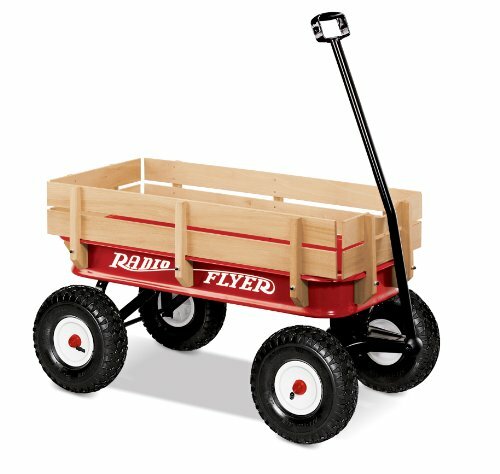 Radio Flyer red wagons sure have come a long way since I was a kid and the new accessories for them make me want another one even though I have no children, lol. Great gift idea, Cheers!